Yes you can. Yes we did. What started out as a quick trip to Amsterdam turned into much more. We wanted an easy getaway before the summer so we looked at what direct flights were available from Boston where we could use those frequent flyer miles and Northwest/KLM to Schipol/Amsterdam fit the bill. I have always been a huge fan of 17th Century Dutch painting and wanted to explore some of the cities which were so important to this craft. 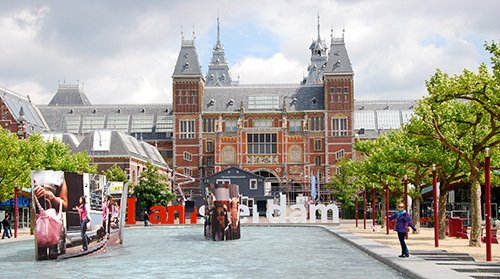 It also seemed a good time to give Amsterdam itself another look…so much good design has come out of the Netherlands. Since we were already renting a car to explore The Hague, Delft, Rotterdam and Utrecht… and Belgium seemed sooooo close we fit in a night in Brussels (chocolate, frites and beer.. what more can a girl ask for??). Then T mentioned there were some “nearby” important contemporary buildings he wanted to check out. When I asked where he said “Oh in Germany… it’s on the way back to Amsterdam..” GERMANY?? GERMANY!!?? Well… after a bit of negotiating our little trip to Amsterdam got a little bigger and off the beaten path.. and made Texas in 24 hours look like a spa visit. But everytime I got tired, I have to admit…a little voice in my head kept playing that !?@#$!! Fratellis song from those crazy beer commercials… “Da da duh, da, da, duh…” … ah the power of advertising.